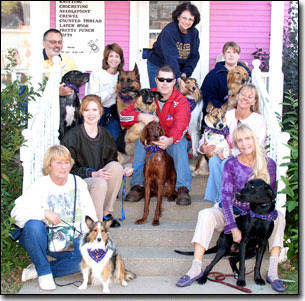 Services Offered | Canine Training<p>by Mystic Moon, Inc.
9 happy dogs & 9 happy dog owners. touch, potty training, and so much more. Please check my Credentials link. The first time I meet your dog, you’ll see a huge change in your dog’s behavior. Trust me! This Class is a great foundation for you to bond with your dog; and, for your dog to learn English, and basic obedience. While teaching your dog (who doesn’t know me) I’ll demonstrate sit, drop, here, be nice, come, house breaking tips, and much, much more. Class size is limit so we can spend plenty of time with each student. After you-2 graduate from my Class, I come pick up your dog, train it while it’s visiting me, and drop your dog back off at your front door. All you have to do is pack your bags, and go have a great time. Let’s train your dog, so you can take that leash off, and trust your dog to stick with you. This Class has major distractions. This class will also greatly enhance your handling skills in therapy, conformation, obedience, agility, etc. We meet in your home, to evaluate your dog, and what behaviors are more desirable. Each week we evaluate your dog's progress, and can adjust your homework accordingly. This class will greatly enhance your handling skills in public, teaching off leash handling. Training with minimal to moderate distractions.This class is conducted in the real world…Valley Junction Farmer's Market, malls, grocery store parking lots, etc. My goal is to provide opportunities to safely socialize your dog in (what appears to be) “unpredictable” situations. Also, I will teach you how to be a “pro” active leader, instead of a “re” active follower. Your dog handling confidence will soar. Trust me! * Educational Demonstrations - No charge! Schools, or other Youth Groups, at no charge (subject to Tonja’s availability.